This region of the Okavango Delta is known for its horse-riding safari's which allow you to ride among the wildlife. Its seasonal floodplains are home to Zebra and Wildebeest as well as Tessebe. You may even spot the rare Roan antelope or Gemsbok. Xudum Concession is known for its horse riding safaris in the Okavango Delta. There are a couple of camps that specialize in these horseback safari's. Horse riding is a truly wonderful way to go game viewing in the Delta as when you are riding the animals view you as a four legged animal and perceive you to be less of a threat; this means that you are often able to ride right among the animals. It also means that you have to be careful about predators, and follow the guide's instructions carefully. This area of the Okavango has been slowly drying up over the last century as more water has moved towards the Khwai area of the Delta. Therefore there are drier savannah floodplains in this area. The annual flood arrives here later than in other areas of the Delta from about June to September. There are large areas of open savannah and small areas of floodplain. The landscape is dotted with Leadwood thickets, and Mangosteens, Marula's and Sausage Trees. The area is characterized by lots of Wild sage. In the North of the concession where the Boro River forms its border with Moremi, there is a large tract of established riparian forest. As with most areas of the Delta, more animals can be seen during the dry winter months when the congregate around the permanent water sources. 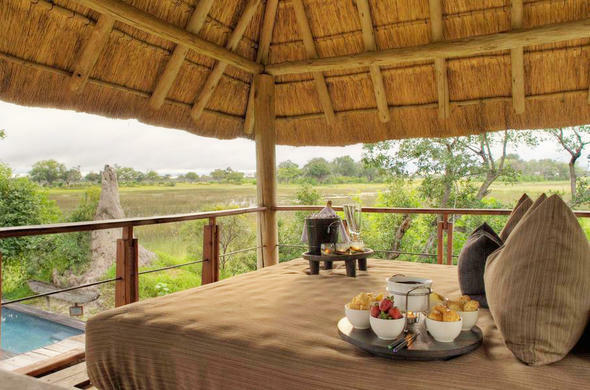 This is the best time to come on an Okavango safari to this area of the Delta. In the summer months, the dense foliage makes game viewing harder and the animals are more widely spread, as water can be found throughout the concession. There are large numbers of Tessebe here, as well as many Lions. They are the dominant predator, though Hyena and Leopard do occur. Cheetahs are rarely seen, and this is often in the dry season when the plains have dried out. You can see common Delta antelope such as Impala and Wildebeest, as well as Kudu and Zebra. In the drier areas of the concession away from the camp you'll find Eland, Gemsbok and Roan. Small groups of Elephants may be seen year round, but in the dry winter months large herds of Elephant and Buffalo move through on their way to more permanent water sources. The area has a good mix of habitats that are home to many species of birds. The wetlands, floodplains and riverine forest are home to Saddle-billed storks, plovers and Spurwing geese. Red Winged-Pratincoles gather here in vast numbers in the winter months as the flood waters come in and disturb insects or invertebrates. The drier regions are home to Black-bellied Khorans and good numbers of the endangered Wattle Crane. Raptor species are also well represented with numerous Vulture species. Eagles include Bateleur, Fish and Tawny Eagles as well as migrant Steppe Eagles in the summer months. Yellow Billed Kites are commonly seen hunting on the concession. You can enjoy the fantastic scenery while on horseback safaris. Most of the camps in this region are reached by plane as no self drive safaris are allowed in this region.